Each year, the month of May is somewhat of an anniversary celebration for me. Although it seems like yesterday, in May, 2001 I naively flew off across the ocean to an alternative clinic in Germany looking for answers, hope and healing, for my undiagnosable medical condition. Weighing in at 89 pounds on a 5-foot-6-inch frame, I was a walking skeleton and apparently looked like the only thing I was about to cross, was death’s door. My daughter had even given me permission to die. That truly shocked me. So in 2012, when I was invited to join World Neighbors on a physically challenging trip to visit the forgotten people in the poorest regions of Peru, I admit, I was very hesitant. Then I realized I was being offered an opportunity to test my physical resilience, almost eleven years to the day after literally being unable to even walk up a short flight of stairs. The only answer was yes. Always my philosophy: Say Yes to Life. The trip demanded more of me than I thought I was capable of. Cold nights in high altitudes without heat or hot water. Hours of driving on what I came to call ‘non-roads’. Soon the luxuries we take for granted in North America were a longed for distant memory. I slept in layers of clothes and developed a new gratitude for all I was blessed with, including fleece pants and a jacket which became my comfort. I could write extensively about the challenges, but they soon took a back seat to the real story. The story of the poorest people of Peru, who although ‘poor’ by our lifestyle standards, have an incredible richness of spirit, with sincere love and commitment to community. I discovered that World Neighbors uses a methodology that is somewhat unique. They work with the community to understand their specific needs. They don’t give handouts or decide what is best for the people. 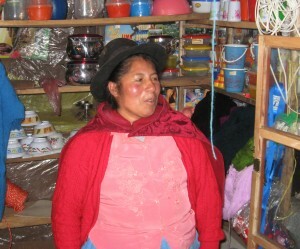 In Peru, they work with a savings and credit model and each person must match the credit offered…50/50. No exceptions. Even a very small initial credit can foster confidence and as the recipient thrives and pays back the credit or loan, they soon apply for larger credits to expand and enrich their lives. One of the things that struck me was how the women of even the smallest communities, find a personal sense of empowerment. In a society that would be considered patriarchal by nature, we found women with equal status and often men declared that their wives were equal decision makers in all aspects of their lives. Gender equity, which we might take for granted, is one of World Neighbors focuses in all 45 countries they work in. Often they go to the end of the road, where no-one else offers help. It reminded me of being metaphorically at the end of the road and how the smallest glimmer of hope kept me going in my most critical of times. World Neighbors offers hope to what I’d call the lost people of Peru. Their work is done in the forgotten communities, where they form community committees, working with them for eight to twelve years, supporting and educating until the community is self-sufficient. Long term solutions, not short-term fixes. An absolute stand out for me, was Candelerea, a humble, yet brave woman, who was uncomfortable about having her picture taken, as she had not dressed up for the occasion. Yes, women are women everywhere! She was one of the original ten on her community committee, the only woman. I saw her light up like her name, when she proudly told us that she was currently on her fifth loan and with this help, had been able to send two of her children to university (previously unheard of), one studying to be a teacher and the other an accountant. Economist Esther Duflo of M.I.T., who studies poverty, found that often anti-poverty programmes “go beyond the direct impact of the resources they provide.” It is the injection of optimism that dramatically improves both the mental and physical health of recipients. Her studies confirmed that it is an absence of hope, that contributes to keeping people trapped in their poverty. This was very clear to me in Peru. Many of the people had fled their homes during the 1990’s rebel uprising. They felt a hopelessness on returning to virtually nothing. As World Neighbors offered hope and built trust, communities soon began to thrive again. This was true from the smallest of communities of 19 families, to the largest of 1200. As I discovered from my own personal experience, hope is a powerful fuel, which drives the human spirit. And this is what I saw in all the villages we visited. Everyone had the chance to flourish, with opportunities for each and every person. We met women doing a wide variety of work. From raising guinea pigs (the Peruvian national delicacy) and using the manure to enrich their crops, to women expressing their artistic souls, using their talents weaving exquisite blankets and sweaters. Another absolute light for me was Maximina, a smiling cherubic 44-year-old mother of 5, (ages 5 to 26), whose entrepreneurial spirit shone. After she put aside her initial fear of having never managed money, she was one of the first eight in her community to receive a credit. She hid hers at first, afraid she wouldn’t be able to pay it back. With the reassurance and support from the World Neighbors team (all local Peruvian people) she gained the confidence to build a small empire for herself. Starting with 500 soles (about $192), she bought a small cow. Next she supported her son’s schooling. The third credit helped expand her home. And the fourth allowed her to finally buy the loom to begin weaving her colourful blankets. People come from miles around to buy. She was sold out on the day we visited. As Maximina expanded her business, she continued to realize her dreams. She reminded me of the “every woman”. Hoping for a better life for her family and keen on traveling and learning more about building her business. She’d already learned about medicines for animals and now sells them in her small store. In her words, “I am now capable of managing anything. Before World Neighbors I never thought I could have a position of authority in my community. Now, I was president of the community.” She has a deep desire to travel to other areas to learn about other women’s work and to encourage them. Several days before we visited she took on a student, apprenticing a younger niece in sweater making. I joked with her that she was really “maximizing” on her name. She laughed proudly at being recognized for all her accomplishments. This for me, is the real joy I witnessed in Peru. The journey was challenging and tested my resilience. These people must rely on their resilience every single day. They are people who have little, yet appreciate everything. The children often eagerly walk up to two hours each way to school. These women have the same dreams and hopes that all women have. To be better. To see their children have more than they do. Their hearts are with their communities. They support and encourage each other. What World Neighbors offers is hope and support. They understand the people they are helping because they are the people. A piece in the N.Y. Times, “The Campaign Against Women”, caught my eye and I read it with interest. The piece talks about women’s rights being attacked by the Republicans on Capital Hill. It made me realize that the heart and soul of women does not lie in politics or legislation. My trip to Peru confirmed for me that real power comes from within. It is born of spirit. We are entering a time in our own history, where the feminine energy is rising. As it is born of spirit, its power will not be extinguished. #women #feminineClick To Tweet. And as so often happens when I’m writing, something shows up that aligns perfectly. This Gaping Void by Hugh MacLeod had me smiling. Subject line: Rock n’ Roll. The message succinctly says it all. “One of the great tragedies of life, and you’ll find it deeply embedded in every major world religion and mythology is to know that the power, the life spirit, is within you, and yet you choose to ignore it. Call it rock n’ roll. Call it the voice of God. (Or) Call it anything else. Only you as an individual can decide to awaken it. It’s a decision only you can make. Thank you to World Neighbors and the people of Peru for their inextinguishable spirits. Words cannot really express my gratitude. It was truly an extraordinary celebration. I invite you all to experience and share your inextinguishable power. It is always there. Sometimes we have to step outside our comfort zone to be reminded of how alive we really are. Rock n’ roll. Beverley, this story touched me profoundly. First, the fact that you were on the edge of death and came back to inspire us with your story is incredible and moving. Second, I love that you shared the stories of Peruvian women. I’ve heard of micro loans especially for African women and have made a conscious decisions to purchase in stores that help these women improve on their lifestyle. I’ve also looked to support organizations that help women create a better life for themselves. You’ve given me some options to consider. Thank you so much, Claudette! It means so much to me to hear that this story touched you on such a profound level. I was deeply touched meeting these incredible people, especially the women. The work that World Neighbours does, is quiet work in many ways. They are not well known and yet the work they do is indescribable in how it impacts the lives of the people and their communities! Truly magical in many ways. It is definitely an organization who strives to empower people and give them opportunities they need to make better lives for themselves and their families. Thank you for considering them as an option for you to support. Whew! What a lovely testament to women everywhere. I believe hope is key for wholehearted living and these women are LIVING their LIVES with PASSION, HOPE, COURAGE, and LOVE. I really appreciated your examples of these beautiful cherub women making a difference in their communities. One of the reasons I donate to Kiva is to help women like them have hope and build a better life for their families and communities. I also appreciated the rock n’ roll analogy, Bev! Thanks so much Tandy! I appreciate hearing that you enjoyed this article as a testament to women everywhere, as that was my intention. The women I met in Peru were so kind and passionate and had so much hope, courage and love. It was a pleasure to meet them and to share them with others. Some many people mention Kiva and I agree that they do amazing work supporting women to help empower them to build businesses and communities. Glad you enjoyed the rock n’ roll analogy too! I love that, so appreciate that you resonated with it. Women are truly the Soul of the Planet. Thank you for this beautiful insight into the strength and heart of women in Peru. Women are indeed the Soul of the Planet, Candess! So happy you enjoyed this post about the women of Peru. They are truly strong and heartfelt and live their passions when given the opportunity. I agree that real power comes from within. I fondly recall our visit to that gorgeous Spanish-speaking country, I used that time to pause and honor it all: the dance of life I’ve done for the last several years, the Spanish language, my large and loving family, and the women I call my strength and song. Thank you for sharing your experiences visiting Peru, Rachel! Your experiences sound flowing and lyrical! To feel that connection with the women and to see that women are connected in ways we so often overlook in our busy day-to-day lives, is a beautiful way to pause, reflect and honour it all. What a terrific read! (Although I was shocked to learn you were so ill; glad you fought back.) I love the notion of outsiders actually asking what locals want and need to prosper and thrive. We have such a tendency, we First-Worlders, to assume we know what works for everyone, what’s “right.” And I am as guilty as anyone of that. To women’s success throughout the world! So happy you enjoyed reading this post, Jackie! I appreciate hearing it from you, knowing you are a consummate writer in your own right. I love what World Neighbours does as well, as they truly work with the community and never impose their agenda. I’m 100% with you on wishing for women’s success everywhere! Thank you so much for this well written post. Your own personal story introducing the story of the resilient women of Peru were highlights telling a larger story of service, opportunities and choice. Thank you for introducing me to the World Neighbors Group. I am familiar with an love the work of Kiva which is similar. I believe in this kind of support to women and to men that changes lives and communities. Thank you Meghan! I appreciate hearing that you enjoyed reading about the resilient women of Peru and World Neighbours. The timing was not lost on me, in relation to my own story and how far I had come. I also know about Kiva and they do incredible work supporting women and building community. Although World Neighbours works in 45 countries around the world, somehow they do not have a high profile and I am delighted to share them with and the incredible work they do. How beautiful it is to share the strength of women. The feminine is rising. I absolutely agree that the feminine is rising on our planet, Heather! There is no turning back. We see it everywhere and these women of Peru were such an incredible example to me of how strong women are…everywhere! BAM! “One of the great tragedies of life, and you’ll find it deeply embedded in every major world religion and mythology is to know that the power, the life spirit, is within you, and yet you choose to ignore it. Wonderful stories of resiliency and empowerment. Thank you for sharing your magic. Love, love this quote too, Laura! It was definitely a big BAM for me when it landed in my inbox as I wrote this piece. Yes, as free individuals we can decide. It is up to us. Glad you enjoyed this story of resiliency and empowering others. The trip was indeed a magical one. Thank you very much Sharona! Peru was not a country I had hoped to travel to, but my experiences there will certainly last a lifetime. 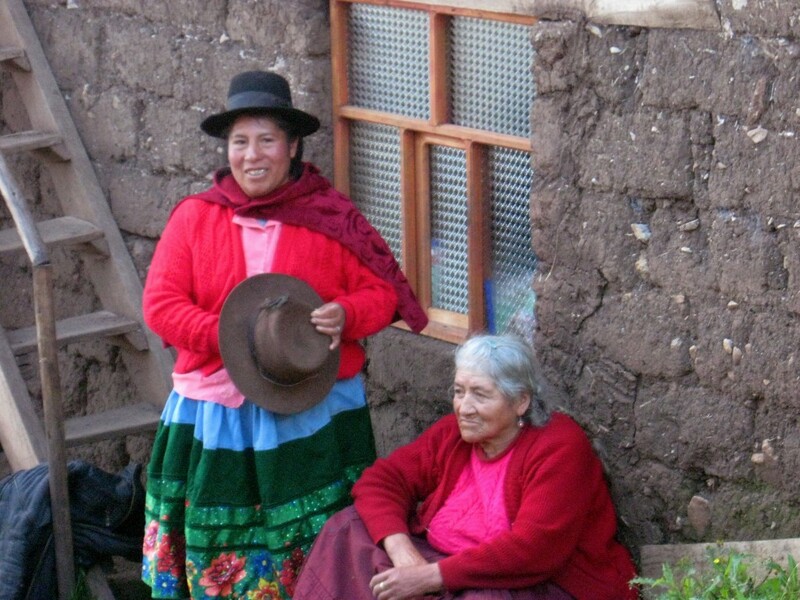 Happy this post gave you some insights into the people of Peru! There’s a lot here. I hate to zone in on just one thing, but I have to say, your quote “Although “survival of the fittest” has always been accepted as the standard for biological behavior, we are more inclined toward peace than war, more wired for co-operative existence and mutual aid than competition.” Makes me happy to read. Co-operative existence gives me hope and optimism. Women are amazing and deserve lots more than one day a year – where would we be without them? Glad you found a lot to digest in this post, Cathy! I am so happy that particular section stood out for you too. I personally find it fascinating that all the research shows we are wired for co-operation and for peace. Glad it gives you hope, as looking at our world today, we wonder what has gone so array when we see that is not the norm. What an inspiring story! We all need to spend some time seeing how gratitude, the kindness of strangers, and courage can change a whole community! Thanks so much Barb! I agree with you too. Gratitude and kindness and giving people opportunity, does have the power to change an entire community! Absolutely amazing article Beverley, what a gift all the way around. Your words – “They work with the community to understand their specific needs.” is key and we can learn a great deal from cooperation not competition. Hardships, yes but the varying perspectives of each culture is a lesson in itself. Thank you for sharing your experience in Peru and for giving us a view of the natural strength of the women in regard to their personal life in this community. Thank you so much Debra! The trip and these people were truly amazing and thank you for seeing how powerful the work that World Neighbours is doing is. I loved how they worked with the community and the success they see when we lead from community and co-operation. The women truly were incredible and it is a delight for me to share them with the world. What an amazing and powerful story! Thank you so much for sharing it! I had never heard of the organization, World Neighbors. It sounds like a wonderful organization that is making a difference! Thank you so much Kris! World Neighbours is an incredible organization and they are doing so much good to support communities like the ones I saw in Peru. These women (and men) of Peru were so inspiring for me and hopefully for others who now read about them. A beautiful and inspiring article! I can see your visit helped to heal a huge part. what a wonderful program for these women and people. I can see how easily it can build hope and courage for mothers and family. Thanks so much Gill! The work that World Neighbours does is incredibly inspiring and also impactful to the people they work with. It was both eye opening and memorable for me indeed. Lovely post about the power of women no matter what their circumstances may be. Thank you for your lovely traveling story. Thanks so much Natasha. Women truly are the same everywhere, regardless of their circumstances. I’m glad you enjoyed my traveling story too! In reading your post and saw the… lady who didn’t want her picture taken as she didn’t feel she was dressed – women are women everywhere.. loved that.. and the fact that.. when women are together, we find ways to empower each other and give each other the support they need. It reminds me of being in a grocery store line with my ex (hubs at the time) and the lady behind me concurred with me… I reminded him, women stick together… we sure do. We have to! Kristen Wilson recently posted…Why You Should Be Concerned About SEO! Love all your observations from this post, Kristen. Appreciate you and how you support women too. And yes, we women often have to stick together and support each other, especially at this time in our planet’s history when we all see how the feminine energy is rising…finally! After this trip I really got that women are women everywhere and we all have the same hopes and aspirations and desires for ourselves and our families. Beverley, I love your post and so happy you said yes to life! I am a great supporter of Kiva and how that program empowers so many. What an amazing experience Beverley! This reminded me of some of the amazing women I learned about through KIVA. I’ve always loved the work that organization does, and not at all surprising to see many, many of the people involved are women. In fact I’ve always focused my sponsorships on women and haven’t had a single one not repay the loan. Thank you so much for sharing this beautiful story. Thanks so much Marquita! The work that World Neighbors does does sound similar to the work Kiva does, and both of these organizations are making real and lasting differences in the lives of people. What I loved about World Neighbors was that they actually employ local people in each country to continue working with the communities to make sure their concerns and needs are being heard and acted on. It is truly remarkable how especially the women I met, shine, when given the smallest amount of encouragement and support. I think giving women loans and sponsorships is a very empowering way to help women succeed in their lives! Thank you for sharing your inspiring experiences. Thanks so much Betty! Happy you found the women in this post an inspiration to read about. They certainly were to me and I feel grateful I had the opportunity to experience their generosity of spirit and their courage and resilience. Something I know is dear to your heart as well. Amazing post. Thank you so much for sharing. Women are amazing. I appreciate the glimpse of World Neighbors, as well. Rock ‘n Roll! Thanks so much Denise! Appreciate hearing you enjoyed this post. Yes, women are amazing and the more we get to witness and embrace this, the more we are supporting each other on our paths. The world World Neighbors does is remarkable. And to us all…Rock’n Roll. I always love how you weave your stories together. They read like mini novels. I always know when I going to be reading one of your posts that this is something you read slowly and savor. Again a beautiful story about your own challenges and how you reflect on the women of Peru. A very telling tale about the resilience of women. Thank you so much for Joyce! I really appreciate hearing that my sometimes long stories, engage you and have you reading them in a slow and savoring way. One never knows in our fast-paced world if people will take the time to truly engage themselves in what they are reading, or if they are just skimming through. This trip was probably one of my most challenging times, so it is very reassuring to hear that you found it to be a beautiful story. The women of Peru are truly remarkable and I imagine they are very representative of women in many places around the world, living their lives to the max with courage and great resilience. Thank you for sharing this beautiful story, Beverley! It brought up so many beautiful memories for me, of travels in remote locations where the strength and sense of community of the people were what stood out the most. Where the land is sacred and the connections to the spirit of the place and themselves are what sustain the sense of aliveness and joy. Travel is such a wonderful way of reminding us of deeper truths, shaking us out of our comfort zones to find beauty in challenges and in places we might not expect it to be. Thanks again, for the words that triggered the memories. Thank you so much for sharing your wonderful memories, Jenny! It sounds like you have had many incredible travel adventures to a wide variety of places where you’ve been able to interact with different cultures. My experience in Peru, truly was both unexpected because of the hardships and also joyful because of my experience with the people, especially the women, I got to meet. I agree with what you shared, about how so often these other cultures have a richer and deeper connection to tradition, especially the land which they still have reverence for. The power we all have inside of us, the power of spirit, the knowledge and awareness of our inner presence, is what creates change in our world and gives us the courage to move forward. As you quoted in your post “The absence of hope is what keeps us in poverty” It’s funny that you should write about this today as only this morning I was thinking about all the poverty, suffering and pain in the world and wondered when did people stop believing? When did people give up hope? Because surely, the world would be a happier place if everyone could trust in the power within. Don’t mean to get too deep here, just an observation. Thankfully there are programs like World Neighbors to bring hope and positive energy to these communities. Bravo, well done! Lisa Swanson recently posted…Who Do You Turn To For Weight Loss: Personal Trainer Health Coach or Nutritionist? Absolutely love your thoughts, Lisa, as it really resonates with what I see and believe as well. When did people give up…mostly on themselves it seems. They have become complacent and stopped believing in the power of one, the power within each of us. I see this surfacing as I watch the U.S. presidential party race. What some of the candidates stand for are diametrically opposed to these human values. And then there are the candidates who seem to fully understand and speak the same language that we both are expressing. It will be an interesting year and few years, as the energy continues to shift and change and my hope is that big and positive changes are now possible. On a final note, yes, what World Neighbors does, is truly incredible. The programs are so supportive and life affirming and the reason they work is because they empower people where they live. In all of the 45 countries they do this work! I am reading this a few days before Int’l Women’s Day – what a great story of the true power of women- coming from within that not so much pushes them forward – but pulls them. Beautiful observation Teresa! Yes, women and men have the power within. The key is to tap into it, acknowledge it and let it guide the way. Push or pull…it is all about moving in a forward direction. Great article, Beverley! I absolutely am convinced in the idea in your song lyric – the power is within us. I was once talking to a person in Overeaters Anonymous about the concept of “Higher Power” and she said, “Well, I think we all have a higher sense of self.” I’ve never forgotten it. I think you’re also correct about the feminine energy rising. And we aren’t the only ones – the other night on a national political commentary, I heard Tom Brokaw observe that the 2000’s were going to be the milieu of the female. Go Women – and hats off to those who are really coming up despite all odds!! Love all the points we offered in your comment, Joan. Many thanks for confirming some of what I shared and truly believe as well. Yes, the power is always in us and all it needs is a bit of encouragement and support to spark us on. The feminine energy is rising on the planet and it is so interesting to watch our patriarchal society fight it all the way. That’s wonderful when the news media is acknowledging that females are taking back their equal power. I believe this feminine energy might just decide the upcoming U.S. election too. The women of Peru are truly an example of rising against the odds and how a little bit of support and belief, goes a long way. What an inspiring post! I love to read stories about how women succeed in their lives. It gives me strength that I can do it too. Thank you for sharing your experience and Maximina’s story. Thanks so much Sabrina! I’m delighted you found inspiration in this post, as the Peruvian people truly are deserving of our admiration. Yes, we in North America are somewhat spoiled and it is good to see and hear about other women in other cultures who thrive when they have so little. Yes, Maximina was truly a shining light and I can still see her beaming face as she showed us her store and her loom and all her creations. Wonderful memories. Wow! I just love this, Beverley! Your “Say yes to life,” even under the worst of circumstances, brought you to such an amazing experience. I love, love these women! And am struck, as always, with how women forge ahead by building communities, by cooperation, rather than competition. Thanks so much Susan! These women have been imprinted on my memory in so many ways. They are truly an example of the spirit and desires that we all have. When given an opportunity, they go for it and shine. Yes, women do understand the power of cooperation and community and the other interesting thing was that they had the full support of the men in all they do! Very interesting culture and people. What a wonderful story, Beverley! There is so much power in “the injection of optimism.” It is so very life changing as your article illustrates. The way the program is run, not issueing demands but instead consulting with the women and welcoming their input is unusual, but very empowering. I’m glad that you included the two examples of women who really spoke to you. What a marvelous time you had, despite the altitude and cold. I hope your daughter withdrew her permission for you to die!! Beth Niebuhr recently posted…Encore Women? Who Are They? Thanks so much Beth. The trip was truly one that will remain in my memories for the rest of my life. And I agree that there is a lot to be said for an “injection of optimism” into all situations. The World Neighbors program is very unique and because they enlist and employ local people, they address the needs of the people very directly. These were only two of the many women we had the opportunity to meet, and in every case, I was amazed at the entrepreneurship that lived in each of them and only needed a little bit of support for them to shine. It was a wonderful time indeed and yes, my daughter has since witnessed me coming back to life and supports me in all ways to stay here, alive and well! You were so wise to go on this trip despite hardships. It is an expression of who you are in the world, powerful, making a difference, speaking & sharing out. Just keep on. Thanks so seeing this in me, Roslyn, as I had quite a time making the decision to go. I think this experience will live with me forever, as I still see the colours and the beauty in the people’s faces, even today. It was a trip filled with unexpected challenges and yet the joys far outweighed those in the end. Beverley, thanks again for your insight into an amazing world so far away. It is a very useful reminder that destiny is all within our own hands and we should reach out and grab it. Too often wealth is measured in financial terms, but really we should look within ourselves and reach out and grab what is there for us to embrace and realise. Thanks for your insight and comments on this one, Lesley! And yes, often we lose sight of the amazing riches and learnings the people in other cultures can offer us. I agree with you that wealth comes from the inner richness we develop and then share with the world. The choice is always in our hands. We can be the creator of our own lives. Thanks for your lovely perspective, Tamara. Indeed life is about the experiences and the richness of what we have inside to share. These people have very little and yet seem so happy and willing to expand their lives given the opportunity. World Neighbors do extraordinary work in empowering the people from a place of what they need and where they are at, and the women, and men, flourish with just a little bit of encouragement and support. We all have this inextinguishable power within us. Thanks for your appreciation for this trip and how loudly the experience resonated with me. I am happy to have had the opportunity to share it with others. This was a more inspiring read the second time through Beverley. It’s amazing what blessed experiences we have when we put ourselves in a position to truly watch & engage with women of another culture. We have to drop our ethnocentric views & look at them as women as we are…that binds us together in a shared experience. Thanks for sharing this experience so we too may have a small glimpse of our shared experiences with these Peruvian women. Love your perspective on this piece, Liz. Yes, the surprising and memorable part of this trip for me was the realization that women truly are women, regardless of where they live and what privileges, or lack of privileges they have. I never would have imagined how touched I would be to see and experience the women and the lives they are so proud of building for themselves and their families. Glad you felt you got a taste of these amazing women; who they are and how powerful their experiences are in reminding us how much we all have in common. The women you met are very inspiring. I think that as women of developed nations we also need to look at how our trade and other practices negatively impact the ability of people in developing nations to achieve or have access to greater opportunities. Thanks for offering your perspective, Mary. Yes, the people I met were very inspiring, as was the work that World Neighbors is doing to actually empower the people both in Peru and in 45 others countries around the world to actually improve their own lives and the lives of their families and villages. We often have tunnel vision here in our privileged developed world and forget how what we are doing can negatively impact others in theirs. This trip was very eye-opening on many levels for me. In ways I was totally unprepared for, as you read. Beverley, I always enjoy your posts! This one, I will be sharing with my daughter, it is very enlightening and positive. The women of Peru and their children are amazing. Thank you for this post and your positive philosophy on life. Ah… also, I am glad you are ok now! Without health we have nothing. Thanks so much Lisa! Happy to hear that you enjoy my writing and my experiences shared in them. Yes, this is a piece to share with both younger and older women, as it really does affirm how women have the resilience and the inner strength to life a rich and positive life. The women of Peru were truly inspiring. Appreciate your support and your well wishes too. Yes, I am so happy I transformed my own health issues and am now able to share my life philosophy with others! This story is inspiring and a message to those of us who live in more advanced societies that we are not as helpless as we may think we are. Just have to take initiative and do what has to be done to uplift those around us. Thanks for sharing your story, Beverley. There is definitely a message of hope and possibility from the women I met in Peru, Vatsala. Given the opportunity, women (and men) everywhere will flourish and the key is to give them the chance and to assist from the sidelines to help them fly. Glad you found some inspiration in this piece and as always, thanks for your support and sharing your insights as well. This is an inspiring post. I think the 50/50 model is a great idea. Thanks Melanie. Happy this one inspired you. The 50/50 model is a great model…and it works! That is what was so affirming for me to see on this trip with World Neighbors. Heather recently posted…Celebrating New Roads with Chevy – ROAD TRIP! As always, thanks for sharing your story and seeing something in what I write (and experience) that resonates with you, Heather. Yes, the women of Peru and Colombia are amazing examples of the strength and resilience of women everywhere. Given the opportunity, they are ready to shine. And I sense you are definitely a “Say Yes to Life” person as well, so happy that one spoke to you too! Appreciate your support and voice in every conversation. What an awesome post and very inspiring as well 🙂 I enjoyed reading about all the ways that us women are powerful and how awesome we really are! Thanks so much for sharing your awesome thoughts as I always enjoy your thought-provoking posts…..keep on inspiring my friend! Joan Harrington recently posted…What’s The Best Tactic To Convert Your Blog Visitors? Thanks so much Joan! Happy that you found this inspiring and affirming for us women. I am delighted that you found this post thought-provoking and appreciate you and your support on everything I share. Very appreciated! Thanks so much Sharise! I am always delighted when I write something that others can identify with. Sounds like you have your own wonderful experiences with the women in your life and that your positive “say yes to life” philosophy continues to get you to the places you are wanting to go in your own life. Appreciate your and your comments! I love the essence of your post, Beverley! Hope, instead of Fear, cooperation, instead of war and the skewed Darwinian of survival of the fittest. Women are central to creating a world where nature is valued more than the material, a life of inner strength, as opposed to outward pretentiousness. It is all evident in your own story of your journey to true health, whereby you connected with all women, and made us whole. You’re a real inspiration. Thank you. Blessed Be! Thanks so much for truly getting the essence of who I am and what I stand for in my life. I sense that we are both coming from very similar sensibilities in our lives. Women truly are central to creating a world where we value each other, are inspired and in awe of nature and embody the essentials of community and collaboration. I really appreciate you and your support, Renee! Many thanks always. Wow! This is an amazing, inspiring, and empowering story. Women are remarkable creatures. Thanks for sharing your personal journey. Many thanks Niquenya. It was indeed a journey to remember and the women I met in Peru were amazing examples of how remarkable and resilient we women are. Appreciate you reading and your support. Thank you for sharing your amazing experience with us, Beverley! This is a great story and I like it so much! What a great experience and I like that you said “hope is a powerful fuel, which drives the human spirit.” I totally agree with you. This is a great blog. I really enjoyed it. Thanks! Thanks so much Kaz. Yes, hope is a powerful fuel and as I have experienced hope along with action can produce some amazing results. Thanks for stopping by and reading this post. Happy to hear you enjoyed it too! A beautiful post Beverley! Your story is truly amazing and an inspiration to anyone reading your courageous journey from helplessness to health. I thoroughly enjoyed you reminiscing and sharing insights about the ‘poorest people of Peru’. The thing that stood out to me the most was their richness of Spirit despite being poor by the Western standard. I have heard similar testimonials from others who visited small villages in Ghana and Zimbabwe and were forever touched by the humbleness and great sense of community these people lived by every day. I admire your strength and tenacity that you clearly executed on such a treacherous and dangerous road trip. That’s outstanding to say the least! The women of Peru are the greatest example of Hope. They refuse to be defined by their circumstances and celebrate the sanctity of life. They give from a place within freely and joyfully. They are fully empowered because their power is clearly from the inside out. They draw on an internal reference point to make the most of what they have. They are graciously imbued with a sense of self many of us may never even glimpse. I simply adore Candelerea and applaud her for sending her children to University. She deserves a seat on the highest pedestal, though something tells me she would gracefully decline or offer it to someone she deemed more deserving. I love the work World Neighbors is doing to empower communities and give them promise of a better tomorrow. Their approach of stepping back and listening to the needs of these communities shows humanity and engenders self-worth and self-respect at a very deep level. This is fundamental to helping such communities thrive well in to the future. I adore your feedback, Michelle. You truly got the essence of not only my experience, but the experience of the people who so deeply touched me. It was not only eye-opening, but was truly an experience that created life-long memories. The work that World Neighbors is truly admirable and how they work with the people to enhance and empower them, is very life-affirming. Many thanks for your in depth feedback, as it means a lot to me to have you read this piece and truly “get” everything I intended to with this piece. And with all my pieces. Many thanks for your brilliant contributions and support to me, Michelle. It is sincerely appreciated! Thank you for sharing this with us. What a motivating story! I find it strangely comforting to be reminded that “women are women everywhere.” Sometimes we can feel so alone. This trip was so very eye-opening in this way, Lori. Yes, women are women everywhere. Sometimes we discover that in the strangest of places, in the most unlikely ways. Glad this revelation of mine, brought you some comfort in knowing we are truly all in it together! So much in this post resonates with me, Beverley: asking people what they need rather than riding in on a white horse to “save” them; resilience; the phrase injection of optimism; providing long-term solutions rather than quick fixes; and, of course, then Hugh MacLeod’s wisdom arrives. Wonderful post highlighting what we can do when we work together, focusing on our similarities. Deb Nelson recently posted…Do You Know Your Audience(s)? Are You Sure? Thanks for your keen observations while reading this piece, Deb. Yes, I truly believe that working together and meeting people where they are at, is such a key to not only helping, but to building relationships where trust and compassion are at play. Happy to hear the work World Neighbours is doing resonates with you. Although the trip was very challenging for me personally, what I took away, far surpassed the short term hardships I experienced. The people in general, and the women specifically formed lasting memories I will carry with me. Appreciate your support and how much we resonate with each other.